This thumb-sized cam has got to be in the running for title of the Smallest Video Camera in the World! Yet despite its dinky stature, it still packs a punch in the recording stakes! The Mini DV Camera records both audio and video in AVI files and saves them to a micro SD card for computer playback, giving you a maximum capacity of 16GB. Considering its size, the frame rate of 30fps and resolution of 720 x 480 pixels is pretty impressive. It features a sound-activated mode, takes pictures as well as video footage and performs well under low light conditions! 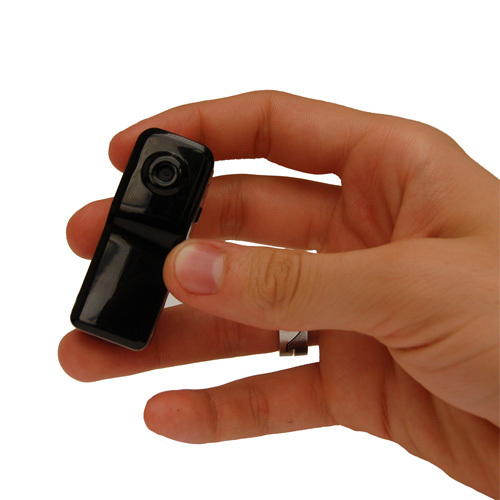 The Mini DV Camera is both wireless and lightweight - good for undercover surveillance - and has a range of clips and brackets provided to attach it to various objects for action footage! Just one charge gives up to 2 hours of record time and 250 hours of standby time and it's also really easy to operate - an ideal choice for both amateurs and experienced users alike.